Sikh Naujawan Sabha Malaysia (SNSM) is moving its annual Vaisakhi kick-off away from its usual venue in Cheras, Kuala Lumpur. 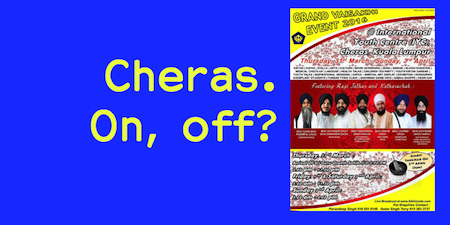 The programme, planned for 31 March to 3 April, will take place at Gurdwara Sahib Klang. “Looking at the current economic situation this will be one good way to prudently spend the sangat’s money wisely. In view of this, it will be more worthwhile to spend on more effective parchar activities rather than one programme,” said SNSM jathedar Pavandeep Singh in a statement released via the social media.